Novella Carpenter loves cities – the culture, the crowds, the energy. At the same time, she can't shake the fact that she is the daughter of two back-to-the-land hippies who taught her to love nature and eat vegetables. Ambivalent about repeating her parents' disastrous mistakes, yet drawn to the idea of backyard self-sufficiency, Carpenter decided that it might be possible to have it both ways: a homegrown vegetable plot as well as museums, bars, concerts and a twenty-four-hour convenience mart mere minutes away. Especially when she moved to a ramshackle house in inner city Oakland and discovered a weed-choked, garbage-strewn abandoned lot next door. She closed her eyes and pictured heirloom tomatoes, a beehive and a chicken coop. What started out as a few egg-laying chickens led to turkeys, geese and ducks. Soon, some rabbits joined the fun, then two three-hundred-pound pigs. And no, these charming and eccentric animals weren't pets; she was a farmer, not a zookeeper. Novella was raising these animals for dinner. neighborhood concierge. The turkeys, Harold and Maude, tend to escape on a daily basis to cavort with the prostitutes hanging around just off the highway nearby. Every day on this strange and beautiful farm, urban meets rural in the most surprising ways. For anyone who has ever grown herbs on their windowsill, tomatoes on their fire escape, or obsessed over the offerings at the local farmers market, Carpenter's story will capture your heart. And if you've ever considered leaving it all behind to become a farmer outside the city limits, or looked at the abandoned lot next door with a gleam in your eye, consider this both a cautionary tale and a full-throated call to action. 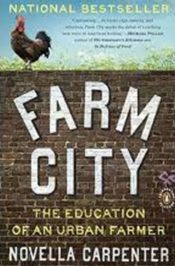 Farm City is an unforgettably charming memoir, full of hilarious moments, fascinating farmers' tips, and a great deal of heart. It is also a moving meditation on urban life versus the natural world and what we have given up to live the way we do. Novella Carpenter has a farm on a dead-end street in the ghetto of Oakland, California. 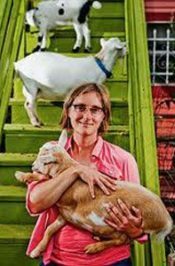 On Ghost Town Farm, she has raised vegetables, chickens, rabbits, ducks, goats, turkeys, pigs and bees. She is also a member of the Biofuel Oasis Cooperative, a biodiesel station and urban farming feed store in Berkeley. Carpenter grew up in rural Idaho and Washington State. She studied under Michael Pollan for two years while attending University of California-Berkeley's Graduate School of Journalism. Her writing interests reflect her interests in farming, food, the environment and culture. Her writing has appeared on Salon.com and sfgate.com (the San Francisco Chronicle's website), and in Mother Jones and Food & Wine. She lives in Oakland.